Fresh out of college, Katherine arrived in Naples from Washington DC in 1996 for a three-month internship at the U.S. consulate. 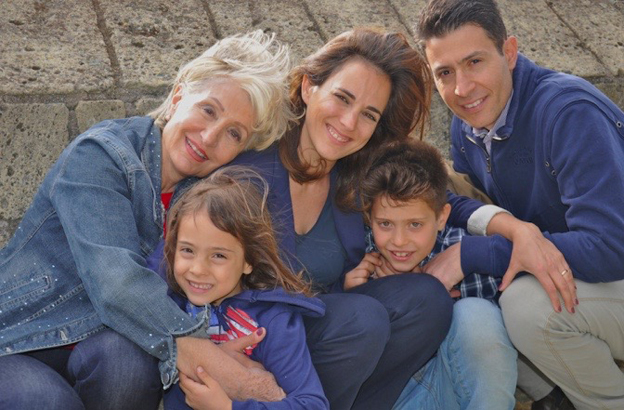 She met a Neapolitan family, the Avallone, soon after moving, and something clicked; without knowing why, she immediately felt at home. 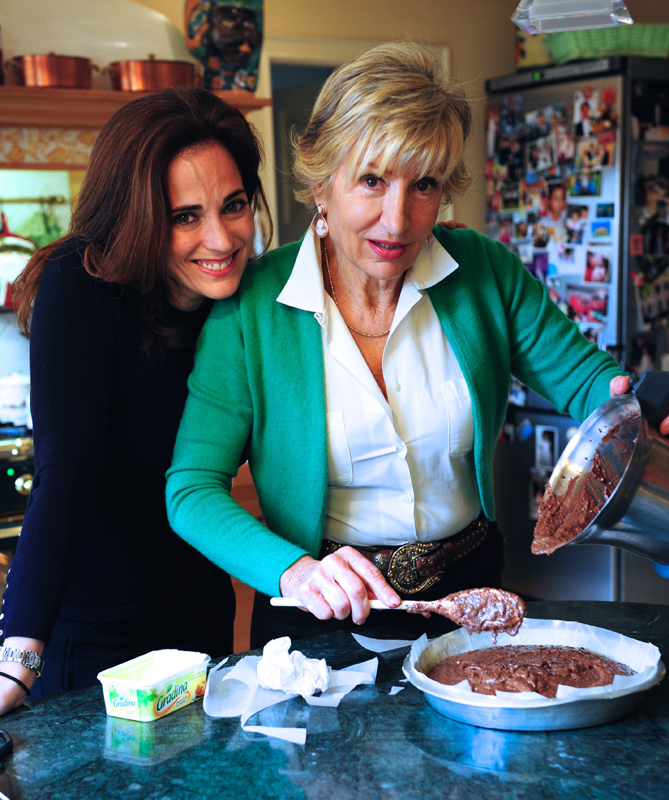 Raffaella Avallone, now Katherine’s mother-in-law, took her under her wing and 'educated' her into Neapolitan ways. The book is the witty account of Katherine's immersion into Neapolitan culture and life and how the experience changed her for the better; coming from a very efficient and rational culture, Naples taught her to relax, to be more receptive to all of our senses, to approach life with a more 'carnale' (carnal, of the flesh) attitude: “There is a chaotic, vibrant energy about Naples that forces you to let go and give in,” Katherine writes in the book. Neapolitans also taught her about the 'art of sdrammatizzazione' (downplaying, minimizing): "How to explain the cheerfulness of Neapolitans? It goes much deeper than great food, great weather, let's enjoy the dolce vita! The dolce vita is not so dolce when people live in poverty, the air reeks of refuse, and corruption and injustice are commonplace. The smiles and songs on the lips of Neapolitans can in large part be explained by the art of sdrammatizzazione. They manage to take the drama out of situations that are truly dramatic." Part of the book explores Katherine's own relationship with food, which, if in America had been her curse, in Naples became her salvation. “During my first six weeks in Naples, I stopped bingeing and lost twenty pounds. I did not go on a diet; in fact, I’ve never enjoyed food as much as I did then. […] Naples is an anti-binge city." Seeing the love that Raffaella put into preparing meals for the family, and how much everyone enjoyed food in a very natural way, made Katherine feel 'sfamata' (fed and cared for), "not just in the sense of the physical food, but also in terms of the culture and the art and the smells and the love and the warmth," as she told us during an interview via Skype from her home in Rome, where she now lives with her husband, Salvatore Avallone, and their two children. - Katherine, how did the idea for the book originate, was it something that you thought about for years? When I tried to explain aspects of my life in Italy, and especially in Naples, to my American friends, I felt I could never quite get the context right; it always felt like I couldn’t really get them to understand and invite them into the culture with me. So I thought to myself, maybe I’ll start writing almost like letters to a friend or to my sister explaining what it’s really like, for example, when you’re eating together on a Sunday, and the way the relationships are played out in the food; I thought, maybe I’ll be able to somehow bring them with me into my mother-in-law’s kitchen. So I started writing just little pieces at a time, and, after a while, I got to a point when I had a lot of these pieces, and I decided to thread them together into a memoir. - What has the response to your memoir been like, especially in the U.S.? The response I love most is people who say, I really want to go buy a plane ticket for Naples! The more I looked around for the image of Naples in the public eye, the more I saw that it was negative, there were many Americans who’d say, OK, we’re going to Rome, Florence and Venice, but we’ve heard Naples is too dangerous, so we’re not gonna go there. So I had this real conflict in me because it was a place that had transformed me in such a positive way that I thought, I’ve got to do something so that other people can experience some of what I experienced. In our world today, what gets portrayed about a place, about a culture is often so different from when you actually live it; Naples is so much about all of the senses, the smells and the sights, and so I really wanted to put that on the page. The other thing that has been very satisfying to me is that a lot of people have said that it has made them remember their grandmother or remember their childhood in the kitchen, when they were making polpettine or pasta. Right now in our world so much is digital, and so much of that carnale sense of living has been lost, that if people are brought back to that through the book, that’s another reaction I’m very happy about. - You write in the book that, living in Naples, you were ‘sucked in and transformed.” Can you talk about the ways in which Naples transformed you? Well, as you can imagine, Naples is a polar opposite from the East Coast of the U.S. with our emphasis on achievement and on rational control; in America you’re brought up thinking that you have certain opportunities and if you set your mind to it, you can achieve anything and you can have happiness and satisfaction. What I realized that was really missing was a more mystical sense of life, and the sense that your body has a knowledge and an intelligence that it’s just as important as what your brain knows. So what happened to me was that, in Naples, I found that I was able to learn to listen to my body, and to appreciate being a woman in a way that in our American education we don’t, so in that way it was very healthy. I often come back to hunger in the book: in Naples, hunger is always good because it’s a sign of health, of being alive and it must be satisfied, whereas in America, if you’re hungry, you’d better control and manage that hunger; in Naples, I found that I was sort of, there’s no English translation for this, sfamata for the first time, not just in the sense of the physical food, but also in terms of the culture and the art and the smells and the love and the warmth. - Naples is also a city with many problems (high levels of crime, pollution, corruption, unemployment) and always ranks low when it comes to quality of life, how do you reconcile the two aspects? I think it all comes back to the division of the private sphere and the public sphere. In Naples, the home is the center of life, it’s where relationships are played out and where people give priority to their time and investment. In the public sphere it’s more like, who really cares, this isn’t mine. I always say, if Neapolitans took care of their city in the way they take care of their families and their homes, it would be the greatest city in the world. I think when people talk about quality of life, they refer to the public sphere, but that doesn’t always lead to happiness, satisfaction, deep meaningful relationships. The quality of life depends on the quality of your relationships, it doesn’t depend on the bus arriving on time. - You write in the book, “To live in Naples is to be on your toes, to have a thousand eyes, to stand up and fight for yourself and your loved ones.” Isn’t it exhausting? Totally, it is totally exhausting! I’m used to having two coffees a day, but when I’m in Naples, I need to have five! I think the key is to always have a sense of humor, and a sense of theater about it, because there’s always a moment in Naples when you’re about to go absolutely crazy, when you’re like, I’m going to have a nervous breakdown, this is absolutely ridiculous, and then something happens that you just start laughing uncontrollably. It’s like a giant stage, so if you lose that sense of humor you can go crazy there, but if you keep your sense of humor and put it all in perspective of this incredible, crazy place, then I think it’s easier to survive. - You’ve lived in Rome for 15 years, how does it compare to Naples? And how does it compare to the idealized image Americans and visitors in general have of Rome as a tourist destination? It’s deteriorated since I moved here. I think the sad thing about Rome now is that people are not happy, they’re very frustrated, and I think that has obviously to do with the administration of the city and with the economy. But I also think in Rome there’s less of an approach to that sense of humor that there is in Napoli, they don’t have as much of the art of sdrammatizzare (downplaying, minimizing). In Rome, it’s almost like it’s always a battle, it’s always a confrontation, it’s always, as my husband says, polemica (fueling an argument). That said, I do believe that it’s the most beautiful city in the world, so all I need personally is to every day nourish myself, sfamarmi, with the churches and the monuments and the beauty of the city, and at that point it makes it all manageable. There’s a magic about Rome that I don’t think any other city in the world has. - What are the things that still drive you crazy about Italian culture after all these years living in Italy? [Laughs.] Still I have a lot of trouble when I’m late or when anybody else is late. Punctuality is in my DNA, so I fight with my husband every single day about it, I can’t help it. We go to Napoli to a lunch that we’re invited for 2 o’clock, it’s 3.15 and a lot of people haven’t showed up yet, the hostess is completely calm, and I’m nervous even though I’m a guest! Also, and I talk about it a little bit in the book, the light weight that the truth sometimes is dealt with, the fact that truth sometimes is a game, ah va be’, non fa niente, diciamo così, or having someone answer the phone for you, digli che non ci sono (tell him I'm not here), these little things that I, as an American, find hard to accept, so especially with child rearing, it becomes a bit of a conflict at times. - How has the relationship with your mother-in-law evolved through the years? And what did she think of the book, since she's a main character in it? My relationship with my mother-in-law has definitely evolved. In the beginning, it was more about her educating me in the ways of Napoli, food and relationships, whereas now it's more of an exchange: she's interested in learning about the U.S. and customs there, and looks to me not only as a daughter to be "trained," but a friend from whom she can learn. Especially when it comes to simplifying her life in terms of convenience - she's even started ordering in! She really loved the book, and not only because she was a protagonist. She said that she felt that I had captured her culture, and had shown Naples in a positive light where so many other representations are negative. She can't stand books and movies that exalt violence and corruption in her city: an uplifting, positive story about Napoli and Neapolitans is needed, she feels. Thank you, Katherine, for answering our questions. We loved your book! You can buy 'Only in Naples', now published in paperback as 'The Mother-in-Law Cure,' here for U.S. orders, and here for U.K. orders. To buy the Italian version, 'La moglie americana, click here.